You can earn 50 yards with this purchase! The Titleist Vokey SM5 wedges designed by master craftsman Bob Vokey define the standard for wedge performance. Bob''s extensive testing, both in the workshop and the with the world''s best players, have resulted in wedges that produce superior spin and control thanks to the innovative Spin Milled technology and deeper TX3 grooves. Every Spin Milled 5 wedge is milled to the tightest tolerance and features a balanced and compact design with a shorter blade length and a rounder toe profile. With three distinct finish options and a larger number of conforming tour proven loft and bounce combinations, there are more ways to hit it close than ever before. 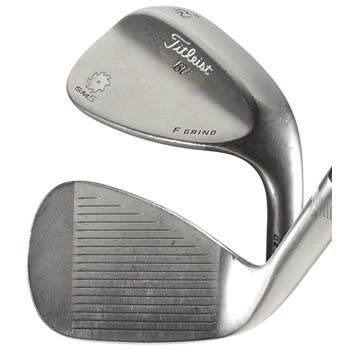 Titleist Spin Milled 5 (SM5) wedges are milled to the tightest tolerance and features a balanced and compact design with a shorter blade length and a rounder toe profile. TX3 groove technology produces maximum spin with distance and trajectory control by channeling away grass and sand for improved contact between the ball and groove edge. F - Grind offers a full sole with moderate camber and small trailing edge ribbon and benefits all swing types (slider/neutral/digger) and performs well in all turf types (firm/medium/soft). Review by David S, 3 years ago.